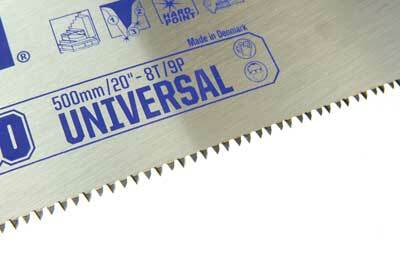 Every saw manufacturer wants to be a cut above the rest and IRWIN, with the relaunch of their JACK saws range is no exception. Are these truly the weapon of choice? A site saw for sore eyes? We managed to get our hands on an early production version to 'try our hand' with it. It is very easy to dismiss a mass produced product as simply 'more of the same'. However, IRWIN has made it clear that they don't make anything unless it is better or different to the rest of the field. 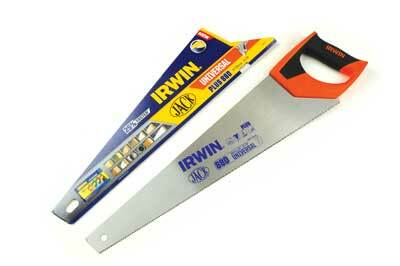 IRWIN JACK is a Danish brand, manufactured in Denmark and universally recognised for producing top quality, reliable handsaws. The new, relaunched versions have the same blades as before with their patented triple angle, hardened tooth form on a C75 steel blade coated with waterborne lacquer to retard rusting. The new feature, which they spent many hours of development work on, was the handle. The reason being that the blades can cut almost any standard building site material but to allow the user to apply maximum effort effectively with gloved hands, a much larger hand grip was required. Modern building site safety entails wearing PPE, including protective rigger gloves, which makes it hard to hold a saw properly. 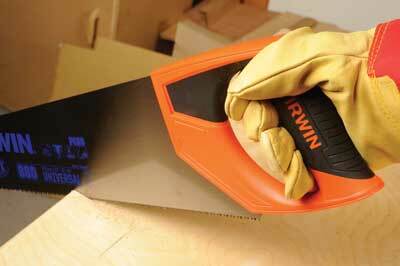 Even so, IRWIN have covered the hand grip with elastomer for comfort and solid grip with or without gloves on. The teeth are wickedly sharp so the extra control should make for faster, more accurate cutting in comfort. At the same time the JACK range has had a 355mm toolbox-sized version added in the orange Universal cut series and there are green handled coarse tooth and purple fine-toothed variants available, the colour coding making selection for each job very easy to do.